"The pursuit of happiness" means more in the Declaration of Independence than simply chasing a fleeting feeling. First, the most important thing is to realize that the happy life is about more than just me: my health, my wealth, my safety and security. A robust understanding of human flourishing means it is for all and that means that our “pursuit” of happiness must transcend narrow nationalisms and thin tribalisms. We would not permit, say, one political party to flourish and deny the chance for another to do the same. Or, to shift the imagery, we would not want our daughters to flourish but not our sons. Why, then, are we satisfied to let some neighborhoods in a city languish, or some schools in a district fail? Why are we willing to let some countries deteriorate? Not because we are committed to the “unalienable right” of happiness, but only because we are selfishly committed to a narrow, individualized understanding of localized hedonism. But, as the positive psychology literature shows (and the biblical book of Ecclesiastes knows this too), more pleasure or more “stuff” will never bring true happiness and flourishing. So, first and foremost, we have to think more globally, more organically. In the republic, all citizens should flourish, and in the global village, all persons should flourish — including those that aren’t (yet) citizens! Second, thinking about happiness as a “global village” issue shows that human flourishing will only be achieved if we take better care of our world. This is a truly transnational issue. All humans share this planet and therefore all humans — and all governments — must take responsibility for its care, particularly in redressing the lack of care that we have exercised for far too long. Without doing so, there will simply be no place for humans to flourish. Could it be any more simple? Third, despite the important role played by governments and law, it is increasingly clear that important things like food, medicine and safe living conditions cannot always wait for the slow movements of governments. Positive psychology has highlighted the crucial role of positive institutions, including — when they function at their best — families, workplaces and communities of faith. These must be ready to do the hard work of helping others flourish when the government proves ineffectual (as it often does). When the government is effective and rightly functioning as one such positive institution, I firmly believe we will see far less “enforcement,” whether via the police or military, and far more “empowerment.” I myself believe these are related: more empowerment of people — facilitating their flourishing — will mean enforcement just won’t be needed anymore. It will become passé! In the Bible, the prophet Isaiah has a vision along these very lines: a time where everyone will turn in their weapon and melt them all down to make more farm equipment (Isa 2:4). That is not a bad vision of thick happiness: for both humanity and the world! Editor's note: Since this interview was originally published on June 30, 2014, it has consistently ranked among the most-read articles in the Emory News Center. As the Fourth of July holiday again approaches, we spoke with Professor Brent Strawn about why a "thick" understanding of "the pursuit of happiness" may be even more important in our current political climate. His additional answers appear at the end of the interview. More than just fireworks and cookouts, the Fourth of July offers an opportunity to reflect on how our founders envisioned our new nation — including the Declaration of Independence's oft-quoted "unalienable right" to "life, liberty and the pursuit of happiness." But our contemporary understanding of "pursuit of happiness" is a thinner, less meaningful shadow of what the Declaration's authors intended, according to Brent Strawn, who teaches religion and theology in Emory's Candler School of Theology and Graduate Division of Religion. As we celebrate Independence Day, Strawn discusses what "pursuit of happiness" is commonly thought to mean today, what our founders meant, and how a "thick" understanding of happiness can be a better guide for both individuals and nations. The Declaration of Independence guarantees the right to "life, liberty and the pursuit of happiness." What do you think the phrase "pursuit of happiness" means to most people who hear it today? I think most people think "pursuit" in that phrase means "chasing happiness" — as in the phrase "in hot pursuit." This would mean that "the pursuit of happiness" has to do with "seeking it" or "going after it" somehow. How does this differ from what our nation's founders meant when the Declaration of Independence was written? It differs a lot! Arthur Schlesinger should be credited with pointing out in a nice little essay in 1964 that at the time of the Declaration's composition, "the pursuit of happiness" did not mean chasing or seeking it, but actually practicing happiness, the experience of happiness — not just chasing it but actually catching it, you might say. This is demonstrated by documents that are contemporary with the Declaration, but also by the Declaration itself, in the continuation of the same sentence that contains "the pursuit of happiness" phrase. The continuation speaks of effecting people's safety and happiness. But the clearest explanation might be the Virginia Convention's Declaration of Rights, which dates to June 12, 1776, just a few weeks before July 4. The Virginia Declaration actually speaks of the "pursuing and obtaining" of happiness. Seeking happiness is one thing but actually obtaining it and experiencing it —practicing happiness! — is an entirely different matter. It's the difference between dreaming and reality. 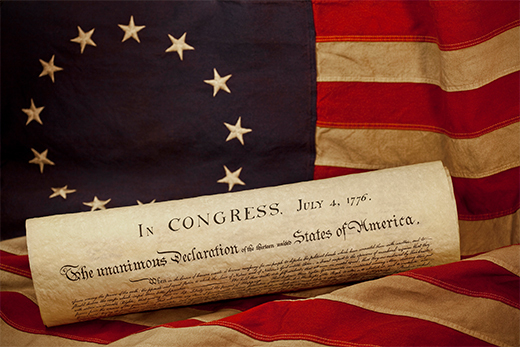 Remember that the pursuit of happiness, in the Declaration, is not a quest or a pastime, but "an unalienable right." Everyone has the right to actually be happy, not just try to be happy. To use a metaphor: You don't just get the chance to make the baseball team, you are guaranteed a spot. That's a very different understanding. The next part of the sentence in the Declaration of Independence states "to secure these rights, governments are instituted among men." What does it mean to say, as you have written, that "the Declaration makes that obtaining and practicing of happiness a matter of government and public policy, not one of individual leisure or pleasure"? I think it means, at least in part, that the happiness of which the Declaration speaks is not simple, light and momentary pleasure à la some hedonic understandings of happiness ("do what feels right"; "if it makes you happy…"). In the Declaration, "the pursuit of happiness" is listed with the other "unalienable rights" of "life" and "liberty." Those are qualities of existence, states of being. You are either alive or dead, free or enslaved. Governments have something to say about those states by how they govern their citizens. If happiness is akin to life and liberty —as the Declaration and the original meaning of "the pursuit of happiness" say — then we are not dealing with momentary pleasurable sensations ("I'm happy the sun came out this afternoon") but with deep and extended qualities of life (the happiness one feels to be cancer-free, for instance). According to the Declaration, the extended quality of happiness — what we might call the good or flourishing life — is or should be a primary concern of government. That means it isn't just about my happiness, especially idiosyncratically defined, but about all citizens' happiness. If the founders' understanding of the "pursuit of happiness" does, indeed, have "profound public policy ramifications, and thus real connections to social justice," what are some specific examples of actions the government does or should take to secure that right today? If we operate with a thick definition of happiness, then we have to think beyond simplistic understandings of happiness — as important as those are — and think about the good life more broadly. It may be that the American Dream, if that is parsed as lots of money and the like, isn't a sufficient definition of the good life or true happiness. It may, in fact, be detrimental. Empirical research in happiness has shown that more money does not, in fact, make a significant difference in someone's happiness. The ultra-rich are not any happier than the average middle-class person (and sometimes to the contrary). So, moving beyond just the hedonic aspects of happiness, researchers have demonstrated the importance of positive emotions, positive individual traits (e.g., virtues), and positive institutions. Governments could (and should, according to the Declaration) enable such things. To lift up just two examples that I think a lot about myself, the government needs to take action to guarantee all citizens' health and safety. A thick definition of happiness certainly includes many things — and sick people can in fact be very happy, can live flourishing lives — but positive institutions that keep us healthy and safe are, to my mind, specific and concrete ways the government can help a country's "gross national happiness" index (the Himalayan kingdom of Bhutan actually measures its country's GNH!). Food, medicine, safe living conditions — those are a few important building blocks of a happy life that governments can address. Your book focuses on what the Bible teaches us about the pursuit of happiness, and you also note the current role of positive psychology as our society's primary arena for asking what "happiness" means. What is the most important lesson we can learn from both of those sources to help us understand and pursue happiness now? Just this — that both the Bible and positive psychology give us a very thick understanding of the word "happiness." It is not about breakfast being yummy. It is about human flourishing, the good life, the obtaining and experiencing of all that can be glossed with the word "happiness," but only carefully and usually with a few sentences of explanation required to flesh it all out. A thick understanding of "happiness" means that we have to think beyond only pleasurable sensations or think about redefining "happiness" altogether if "pleasure" is the only thing it means. If that's the only thing "happiness" means anymore, then we have a case of "word pollution" and we need to reclaim or redefine the word or perhaps use a different one altogether, at least for a while. Redefining simplistic, thin definitions of "happiness" means that we come to terms that the happy life does not mean a life devoid of real problems and real pain. Those, too, are part of life and can even contribute to human growth and flourishing, which means they can and must be incorporated into a thick notion of happiness. As one positive psychologist has said: The only people who don't feel normal negative feelings are the pathologically psychotic, and the dead. Or, according to the biblical book of Psalms, the only people who live lives of constant comfort and pleasure are the wicked! So, positive psychology speaks of post-traumatic growth — a kind of growth only experienced (and only able to be experienced) after grief. Or, to think about the New Testament, when Christians call the day Jesus was crucified "Good Friday," they certainly do not mean by that that it was a fun-filled day. Instead, that is a very thick use of the word "good" and that is the kind of thick use that we must have when we speak of "happiness" — one that can encompass sorrow; that includes social concerns like food, health, and safety; and that is about experiencing the good, flourishing life, not just hoping for it. (Update) Does the current political climate in the United States impact the need for a “thick” understanding of the pursuit of happiness? Since this article first appeared, I admit that I am even more struck now, in 2018, by the need for the government to help people attain — pursue and actually reach — key elements of human flourishing: food, safety, medicine and the like. Politically, of course, people will differ on these issues and how they are best achieved, but it is clear that in recent years in this country we have had vicious political debates over things that are, at root, profoundly connected to these elements of happiness and who will gain access to them. Take, for example, the debate over universal health care. Or debates over gun violence and gun control. Or immigration. Each is complicated and multifaceted. People who are for stricter immigration laws are likely concerned about their own safety and well-being. This is fully understandable. And yet, if happiness is a universal right, which is what the Declaration of Independence states, then that means we must consider the safety and well-being of others, too — including the safety and well-being of immigrants and refugees who would otherwise be turned away at our borders. In this regard, the biblical story of Ruth the Moabitess is rather remarkable. Had she been turned away at the border, then Israel would have never had its greatest king, David, since he was her great-grandson. Or, to continue the lineage a bit further, without Ruth there is not only no David, there is also no Jesus, since, according to the New Testament, he is a direct descendant from Ruth, the Moabite refugee. Or, to switch topics, one might like to stockpile weapons in order to feel safe, but one must ask about the effects of gun culture, the proliferation of guns, and if all that is, in fact, a truly safer way of life for the flourishing of all people. Statistics from other modern industrialized countries in the world that do not have the same gun obsession as America suggest, in fact, that it is not necessarily a safer way — or at least, such data indicate that the proliferation of weaponry is certainly not the only way to think about safety and well-being. So, now, in 2018, I continue to think that the thickest and best definition of “the pursuit of happiness” means we must think about facilitating the achievement of others’ happiness, and not be inordinately or exclusively self-obsessed with our own. Such a regard for others and their happiness would have certainly resonated with the early founders of our country, many of whom were themselves immigrants, and who were concerned not simply with their own well-being but with all those who would come after them in the United States. The happiness of other, future generations was insured, as it were, in the Declaration and its claim regarding this “unalienable right.” Concern for other people’s happiness is also unquestionably true for the Bible where, among many examples, one might cite Jesus' instruction to his disciples: "No one has greater love than to give up one's life for one's friends" (John 15:13, Common English Bible). I have to admit, however, that I am less sanguine now, in 2018, about the government’s interest in and ability to produce widespread happiness of the thickest variety for all people. The vast majority of what comes across the news scrawl these days seems remarkably parochial if not downright tribalistic. The “happiness” that is being sought is typically up for sale to the highest bidder with the most power (including firepower). Such a vision of “happiness” is truly thin and can never lay appropriate claim to the Declaration’s grand vision of flourishing. But the Declaration’s grand vision is still there! And that gives me hope that good peoples throughout the world and throughout society and government may yet seek the greatest good for all humanity. May it be so!